I have no real complaints about my life. It’s a very good life no matter how you slice it and dice it. But sometimes in the midst of all that goodness I find that I’ve overlooked something I would have liked to do. And that was the case on Sunday. I made it to Rover’s final Sunday brunch of the year – something they have not offered before and there is no guarantee it will ever be offered again. I wish I’d indulged a couple of more times over the summer but at least I made it to this last one. J and I arrived for our noon reservation and were seated at a white linen covered table in our section of the dining area. If you have not been to Rover’s it’s located in a house turned restaurant so the dining area is a charming set of small rooms each with just a few tables. This lends an intimacy and feeling of coziness to the dining experience. We ordered Mimosas, made with freshly squeezed orange juice and a rosé cremant. The color of the wine intensified and altered the orange juice color making it reminiscent of a sunset. 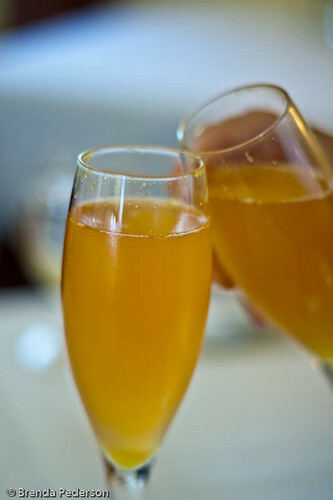 Cremant is a softer sparkling wine than Champagne so the resulting drink was flavorful and smooth with a hint of celebration. 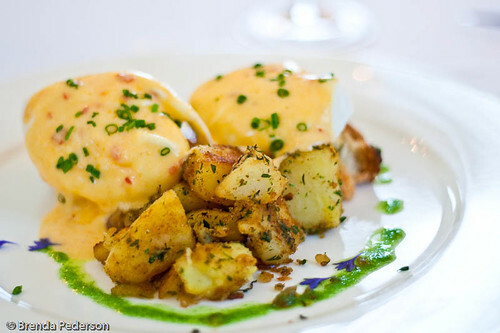 Rover’s is known for its prix fixe dinners and offered both a two and three course menu for brunch. There was also an a la carte section of options. While sipping our Mimosas we perused and negotiated and strategized wanting to make the most of this one-time event. We wanted to pick the best of the best (at least according to our palates) and to squeeze in as much as possible without stuffing ourselves silly. It was a tough decision but we finally decided on three a la carte dishes that we would share. Our waiter was great at helping us orchestrate the order of our courses. We started with Hudson Valley Foie Gras. This is a favorite item on Rover’s menu and is always offered, I believe. 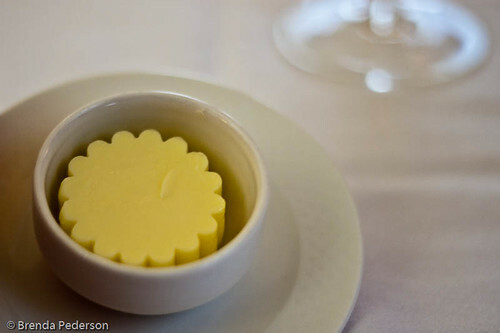 However, what is served along side it changes regularly and always includes some luscious seasonal ingredient. 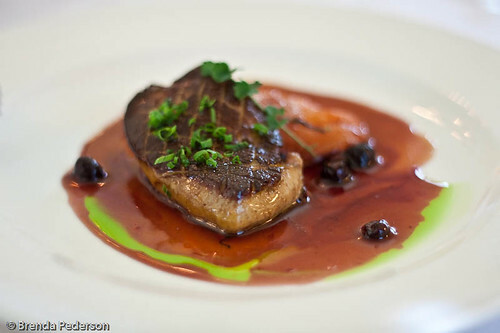 On Sunday the foie gras was perfectly seared so that each bite was a rich, melt-in-your-mouth experience. It exemplified the kind of food that makes you want to close your eyes so that nothing distracts from the flavors and textures you’re experiencing. On the plate was a roasted, thinly sliced, fresh peach along with a sprinkling of blueberries, the pan juices and stripes of harissa hollandaise. Adding any of these items to the foie gras enhanced it. Using bread from the basket provided, we didn’t let the plate go until we’d completely cleaned it. In some ways I wanted to just end there and savor the flavor of that first dish for the rest of the day. But soon it was followed by the next plate we’d ordered, Two Poached Eggs over Braised Pork Belly, Sauteed Spinach and Harissa Hollandaise. I really need to learn how to poach eggs. I can do it but when I experience one that is expertly done I know how much mine are lacking. The eggs used at Rover’s come fresh from a local farmer which is probably a big part of the secret to their success. Silky on the outside and filled with a liquid gold that sauced the pork belly, spinach and toasted baguette it elevated this take on bacon and eggs to a new level. It was time for another little pause to savor what we’d just enjoyed. We ended our meal with a continental finish, the day’s cheese platter. As I have mentioned before I love when I get to really participate in my food and something like a cheese platter is a lot of fun for me. 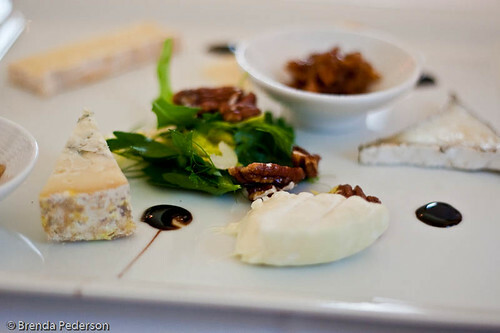 You have the cheese and other little treats to mix and match with it. I can’t really do justice describing this dish since I don’t know all the names of the cheeses. There were five varieties each with their own special quality. Some were local, some imported. Cows, sheep and goats were represented. All provided a unique flavor or texture so that the plate was a little treasure chest of jewels. So, sadly, the brunches are over – at least for the time being. However, the Friday lunches continue and, of course, so do dinners. I think it’s time to remember to get out to Rover’s more often!